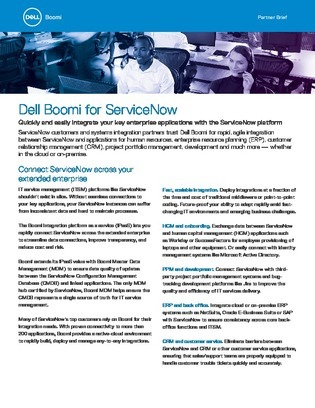 IT service management (ITSM) platforms shouldn’t exist in silos. Without seamless connections to your key applications, your ITSM instances can suffer from inconsistent data and hard to maintain processes. You need to be able to rapidly connect your ITSM platform across the extended enterprise to streamline data connections, improve transparency, and reduce cost and risk. Open this short whitepaper to learn about an ITSM integration tool that can dramatically cut the time and cost of integration, easily connect cloud applications with on-premise systems, improve data quality, and much more.